A look inside one of Red Ear’s rehearsal rooms! Come celebrate Red Ear Studios Grand Opening at 10650 Irma Drive Unit # 27, Northglenn, CO 80233 on Friday, January 18th from 3:00 p.m. to 10:00 p.m. Open to the public! A full day to jam, mini-arcade and hourly give-a-ways! About rehearsal studio: Red Ear Studios is a musician family owned business. 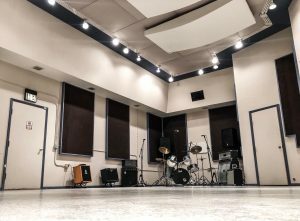 It is a space where musicians, bands, instructors, teachers, and creative artists can rent out the space hourly for rehearsal or band practice. Equipment included in the hourly rate include drums, amplifiers, microphones, and PA system. Also includes Mini-Arcade and WiFi. Renters are welcome to use available equipment or bring their own. Studios fits anywhere from 1 to 20 people in a room. Three of the studios can be rented hourly. Currently ranging from $15 to $25 an hour depending on the studio chosen. Although the property is equipped with security cameras, the studio is not responsible for musicians missing items. Since the studios are hourly, personal equipment is not to be left in studio space. George, the owner, has been in the music scene for a very long time and has traveled with many touring musicians. He is also a member of ASCAP. He wanted to help out the Bands, Musicians, and Instructors in the area to have a place to play without having to be quiet in an apartment or basement. It has been his dream to bring creative artists together in the community.